Before you ‘get out of the building’: How to adopt a top-down orientation to improve your lean startup experimentations. Lean Startup, by Steve Blank and Eric Ries, is a great bottom-up approach. Through local experimentations, you can gradually reveal a promising market opportunity. In fact, think about these opportunities as mountains. As you gradually begin your climb – through customer interviews and minimum viable products – you can find out if this is at all a ‘mountain’, and if so – whether it is high enough to make the climb worthy. As fogginess gradually fades, you can also check if your trail will take you up the top, and pivot left or right if you find a better one. But wouldn’t it be devastating to find out that your mountain was actually a hill, or that your Everest was hiding all that time just around the corner? In other words, can you do anything to improve your starting position before you begin your bottom-up journey? Luckily, the answer is yes! In a remarkable HBR article called Lean Strategy, Harvard’s professor David Collis emphasizes the importance of combining a defined strategy with adaptive experimentations. Although planning in advance and continual pivoting are viewed as polar opposites, Collis claims that they are mutually reinforcing, and in fact must go hand in hand to achieve lasting success. In short, initial strategic analysis provides overall direction and alignment. It can help you uncover promising market spaces, and save your venture from going down the wrong path. Yet, integrating the top-down orientation of strategic screening with the bottom-up approach of lean startup is not trivial at all. At some point, you might even feel it is stopping you from running forward… but eventually, it will help you make sure you are running in the right direction. And that is indispensible! 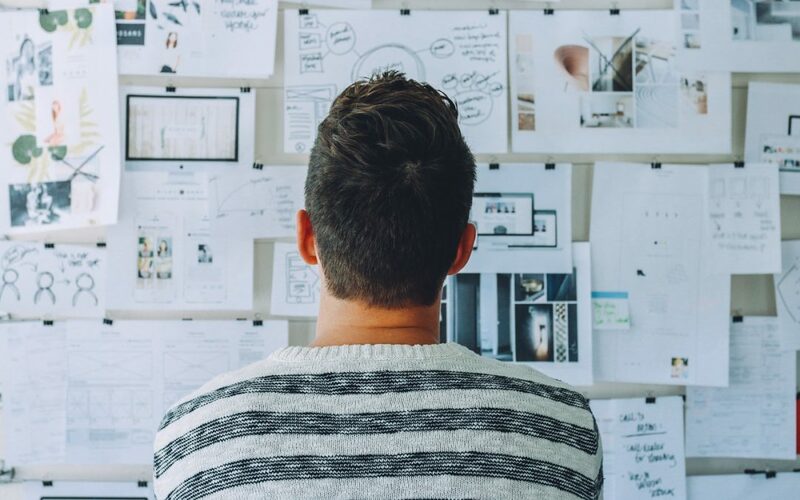 Even though entrepreneurs tend to fall in love with their initial idea, what you should actually do is take a step back, and deliberately attempt to uncover other possible target markets for your innovation. In fact, a Management Science study clearly showed that generating a set of market opportunities at the outset increases your chances of success. This is not only because it provides a choice set, but also because you can leverage these opportunities in your favor later on. You should therefore take the time to identify different types of customers that may value your innovation, and map out your landscape of opportunities – or the mountains that you can possibly climb. Your search for potential market opportunities should not be sporadic. In fact, you are not simply searching for unmet market needs, but searching for those that you can actually address with your core strength or unique competencies. The logic here is simple: relying on your core abilities dramatically increases your likelihood to succeed. To identify such opportunities, think of your core technological elements or unique strengths as building blocks – detached from any envisioned product. This will open you up to other possible applications that can be created with these blocks, and to different types of customers who may need them. Once you have identified a set of potential target markets for your innovation, you should do some analysis to weed out few options and highlight others. Invest some time and engage in a short market research to understand the major pros and cons of your opportunities, and to assess their attractiveness. An attractive opportunity offers high potential for value creation, and limited challenges in capturing this value. This exercise is essential for identifying the bounds within which experimentation should take place. Setting your strategic boundaries will therefore enable you to focus on more meaningful learning cycles. One of the best advices for entrepreneurs is know what not to do. A resource-constrained startup must learn how to put options aside, and concentrate on a primary business idea. This strategic analysis will therefore help you clarify not only which customers are worth further validation, but also which target markets should be ‘placed in storage’. Opportunistic sales and inquiries could also be screened based on these strategic bounds. The wide perspective that this strategic analysis provides is essential before diving into the validation process of a specific market opportunity through intensive customer interviews and minimum viable products. The Lean Startup Methodology is truly invaluable in this search for clear market evidences. Once you are ‘back at your building’ however, you should also go back to your strategic overview, and reflect on your learning. It will help you to interpret the feedback from the market and effectively learn from your experiments. Furthermore, if the validation outcome is simply a no-go decision, you will be able to pivot more easily, and even more distantly, as you already have other options at hand. Put differently, you will be able to combine deliberate and emergent strategies as you strive to find a promising, viable opportunity. 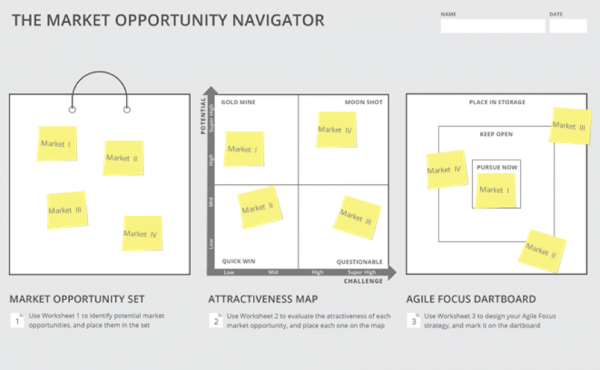 A new business tool that can help you combine these top-down and bottom-up processes is the Market Opportunity Navigator. This visual framework structurally guides you how to generate your market opportunity set, and how to evaluate and prioritize your markets. You should apply it before engaging in intensive market validation – to set your boundaries, and once you gather enough information – to compile and reflect on your learning. Furthermore, the tool will guide you how to set a strategy that focuses on the most promising target while smartly leveraging other opportunities to keep you agile and ready for pivots. One example of a company that was able to combine strategic planning and lean experimentations using this strategic tool is OnSiteIQ – a NY based startup offering visual documentation and safety analytics monitoring to improve safety and quality control in construction projects. Ardalan Khosrowpour, founder and CEO, originally planned to utilize his deep know-how in computer vision and machine learning to tap into the existing cameras in the buildings and create smart ambient temperature control solutions for large commercial buildings to improve the energy efficiency and air quality. Strategic analysis of other market opportunities stemming from his unique abilities revealed the attractive opportunity of improving safety in construction sites, where he eventually decided to set his boundaries: “The Market Opportunity Navigator provides a broader view of the market opportunities before diving into customer discovery with a laser-focused approach. It helped OnSiteIQ exit a local optimum market opportunity. It helped us take a step back from our laser-focused customer discovery and revisit our decision regarding the customer segments and the product-market fit before moving forward” says Ardalan.